A review on one of the epic movies of this generation - On The Job. The story evolved on the lives of an in-cell triggerman, top corrupt/self-centered officials in the country, loyal policeman and an NBI agent torn between "katarungan and kagaguhan." The characters were portrayed by Sir Joel Torre as Tatang, the PRO hitman, Gerald Anderson as Daniel, the hitman's apprentice, Piolo Pascual as Atty. Francisco Coronel, the NBI agent, Leo Martinez as General Pacheco and Joey Marquez as SPO1 Acosta. Sir Joel Torre (Tatang) and Gerald Anderson (Daniel) are being paid to kill. That's their job. They are hired by a certain person named "Mam Thelma." She's the middle person who takes in charge in knocking down the people who gets in between the operations of her boss' boss. Being "On The Job" for Tatang is just for the sake of bringing food on the table back at their home, he showed no mercy everytime he shots his victim, thinking that every bullet that comes out of the barrel is a decent life for his family. As what he often says to his apprentice in the film, "Ito, trabaho lang." Daniel who started as a backup or lookout is Tatang's apprentice, an ambitious, young hotshot guy, however, he is being trained to become a hitman once Tatang "retires" or once he gets his parole. Both of them are prisoners in a city jail. They are being pulled out from the cell whenever they have an operation. On The Job will show you the truth behind bars but will also depict the screaming reality on what our beloved elected legislators and highly respected officials do outside their main lines. There will always be one good egg in a tray of spoiled eggs. This is what the character of Atty. Francis Coronel (married to Nikki played by Shaina Magdayao) is trying to portray, an NBI agent, who happens to be the son-in-law of a filthy congressman who's in allies with Gen. Pacheco. Pacheco is said to be the man on top of the killing operations done by Tatang and Daniel. On his verge of becoming good in his craft and to prove that there is still hope in becoming truthful to what he believed in, he clashes with the different personalities with big names in the government, to the point that he is battling against his own father-in-law. SPO1 Acosta (Joey Marquez) is a lowlife policeman who looks at his job with so much pride. His more than 30 years in service (as quoted in the film), is a proof that being in service to the PNP is supposedly a noble job. Oh well. However, things weren't as smooth for him like missing out a promotion because he's not a puppet of his boss and there's a good friend being dragged to killing cases. On The Job is by far the best action thriller movie of this generation. In this generation wherein we got used to Horror, Romantic Flicks and Flashy Comedy, this is a good start for an Action Thriller to be back in pace. The scenes were greatly choreographed. I got lost in a whirlwind of emotions especially in the hospital scene and when Atty. Francis Coronel was getting out of his car. I just didn't expect things to turn out that way, which is indeed something "new" for a Filipino movie. The main setting of the movie also took place in the sub-areas of Manila where you are able to witness and fully absorb the screaming reality of poverty and criminality. I hate to admit this, but OTJ revealed the truth we're facing today. I commend Sir Joel Torre for always being at his best, if there's a word "bestest," then I may use it to describe how great he was in this movie. He only showed the viewers and his co-actors how beautiful it is to become a Filipino actor. Gerald Anderson on the other hand is amazing. You will be surprised as he shows his "astig" side on this film, a very different trait as to what we see in his previous movies. After seeing OTJ, there's more to Gerald than what meets the eye. I'm also glad to see Joey Marquez back on silver screen. The role of an upright policeman fitted him right. He carries this serious yet funny character. Surprisingly in this nitty-gritty film, he did it so well. 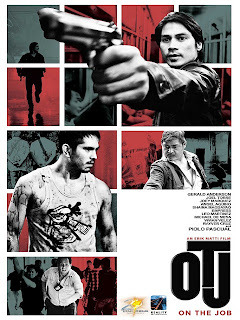 Then we have Piolo Pascual as the NBI agent. He played his character very well although he's being overshadowed by the characters of Joel Torre and Gerald, I think that was enough proof that these days, "talo ng matitinik and mababait." For me, On The Job is not just a movie, it's an experience. Napakahusay! Congratulations to the whole team for crafting a film as wonderful as this.